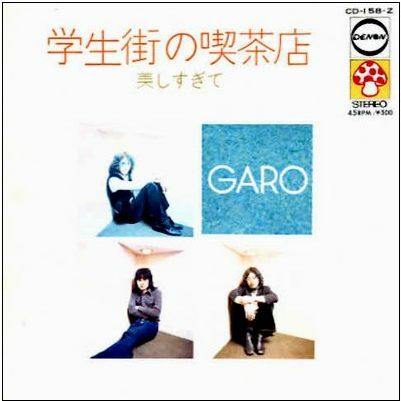 GARO (ガロ), was a japanese Folk group. The band was composed of Mark Horiuchi (born in 1949), Tommy Hidaka (1950-1986) and Masumi Ohno (born in 1949). They were signed on Columbia Records. Garo was named by their powerful manager, who took his inspiration from a hip discotheque in the Kawara-machi area of Kanuma City. The group had a few chart hits, scoring hits in 1973 with ‘Kimi No Tanjobi’ (Your Birthday) and ‘Romansu’ (Romance), and the famous “Gakuseigai-no-Kissaten” which was on top of japanese chart in 1973. Their harmony vocals and acoustic guitar playing, which were heavily influenced by the style of Crosby Stills Nash and Young, became a phenomenon in Japan. Garo broke up in December 1975.